Edward-san, that compile error looks weird, since it's apparently being caused by a warning setting [-Wc++11-narrowing]. What compiler are you using? 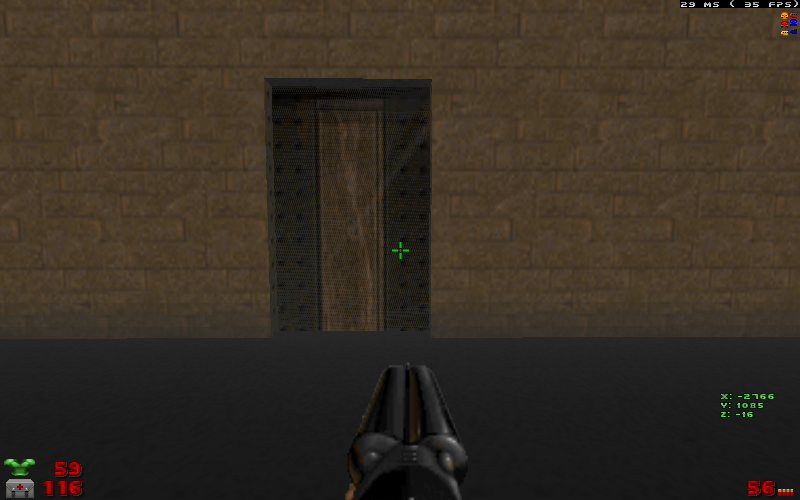 I was able to make the flickering door reproduce on my system under both windows and linux. Turning off fog solves the flickering. The burn wipe works for me. But I made some changes to the shader source recently. Can it be that you somehow still load the old shader with the new executable? That would explain this effect. Ralgor wrote: Edward-san, that compile error looks weird, since it's apparently being caused by a warning setting [-Wc++11-narrowing]. What compiler are you using? Which is a C++11 extension, as these two variables are not static, so this declaration would not work on C++98. A fix for C++98 would be to add 'static' to both the declarations. I thought I recognized the Clang warning style. I wasn't sure though. The thing is that Graf is using VS 2013, which supports SOME C++11 features, including this one. But anyone developing on a modern C++ compiler will have to be careful not to use something outside of what VS 2013 supports. Here is a table showing what c++11 features various versions of Visual Studio support. It looks like this particular feature was only added with VS2013, so more than likely GZDoom 2.0 doesn't compile with any of the older Microsoft compilers either. I think at this point, -std=c++11 should be used for gcc and clang compiles going forward. I just hope VS 14 actually supports the rest of the C++11 standard. On a related topic, I tried to compile GZDoom using Clang for Windows inside of VS2013. Some things compiled, but I ran into some issues and didn't pursue it further. That's a common problem: You inadvertantly use some newer language features, and since you are on a compiler supporting them there is no warning. And then users of older compilers complain. Still, I wonder whether it makes much sense to restrict oneself with using new language features. After all, the VC2013 Express download is free of charge, just like previous versions, and I'd really like to be less conscious about such things. Even though I'm not too thrilled about how many programmers are starting to use C++, there's still lots of good stuff in there. Can you give me a link to that map? I fixed the rest of your issues, but I can't find that demo map by searching for the file name. size2 and size1 will never be negative. See, that's what you get for having the compiler spill pointless warnings. The links have apparently been broken a few times. If none of them work, I can upload it somewhere. I already got it, but the error does not appear. It looks fine. I decided to go back and test 1.8.6. I get the error in that version as well. That particular door is a polyobject. The other doors (and the rest of the room) are fine. The fog and the door are Z fighting, from the looks of it. I don't know if this is the correct way to fix it or not. I just took a stab in the dark. The z-fighting with the polyobject is basically unavoidable without some tinkering with the depth value. Use glPolygonOffset should be fine, it's also being used for other stuff that may cause similar overlaps with almost-matching depth values. Now the door renders fine for me. I noticed that if I open the door, I get these strange effects on the corner of the door: here a list of screenshots.